There is only one input and one output line. There is no electrical wiring, therefore, no explosion safety measures are required. The operation of all sensors is continuously monitored. Point probes are temperature sensors with built-in optical fiber coils. 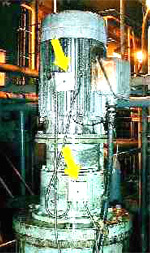 Numerous point probes connected in series can cover measurement points over a wide area. The system can measure many temperature monitoring points at low cost. One optical fiber can measure temperatures at hundreds of points, achieving wide-area temperature monitoring with only simple installation work. Temperatures are measured by an optical fiber. Since there is no electrical wiring, no explosion safety measures are required. One cable (optical fiber) can measure the temperature at hundreds of points. All sensors are connected serially so cable installation is very simple. The loop measurement configuration provides accurate temperature distribution data regardless of the number of connection points and fluctuating temperature conditions. Even if the optical fiber breaks, the system automatically carries on measuring without being interrupted.